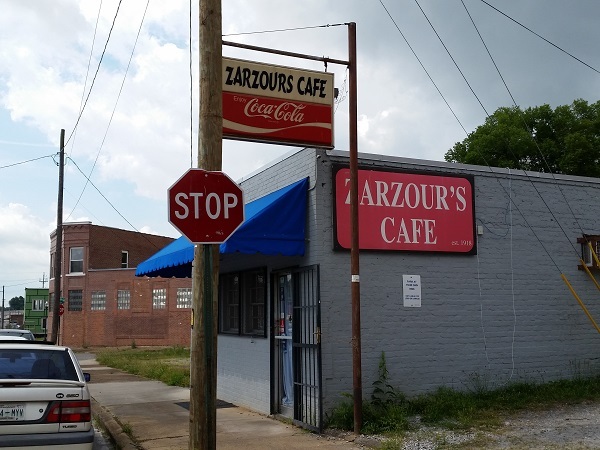 Zarzour’s Cafe, Chattanooga TN (take two) – Marie, Let's Eat! Regular readers might have noticed that on most of our many recent trips to Chattanooga, we’ve chosen to make a second stop at a place that we highlighted once in the earlier days of the blog. This is deliberate; as I’ve mentioned before, some of those 2010-11 chapters need a refresh. So, the next on the list due for a return trip was the legendary Zarzour’s, which I first visited with my older son a little more than four years ago. I told Marie a time or two over the years that the burgers here were excellent, and I suppose that she got so tired of hearing about them that she decided to order something different instead! Zarzour’s is a mere 97 years young, and it’s just a terrific place to eat. Marie and our younger son and I arrived just before they opened at 11, and when the three of us stepped inside to look for a table, the four year-old made a beeline for the counter. He saw those stools and couldn’t be persuaded to take a chair. Then he spent the next forty minutes deliberately sliding off his seat, and “sitting” on his belly, and had a ball just being a kid. Shannon Fuller, whose husband’s great-grandfather Charlie Zarzour opened the place in 1918, has a reputation of being bawdy and sassy – four years ago, she told us hilarious tales of drinking her way out of Knoxville and back to Chattanooga – but she took a glance at our boy rolling around on his seat and said “I swear like a sailor, but I’ll try to keep it clean while he’s in front of me.” Then she got to grilling some great burgers. The burgers here are really good, grilled on a flattop and dressed as you like. 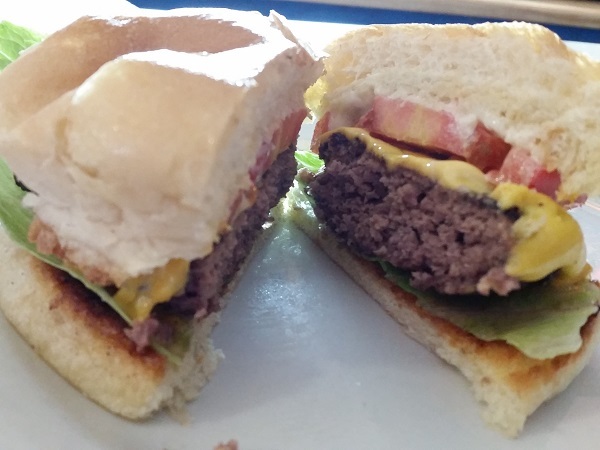 Now, since my first visit to Zarzour’s, we were all wowed by the burgers at Tremont Tavern, and I did, for a time, think those were the best in town. My memory refreshed, I’m no longer so sure. Zarzour’s are so juicy, and I love the crisp bun. Perhaps we can say that for the four and a half hours a day that you can get a burger here, it is the best in town, and Tremont Tavern serves the best on evenings and weekends? That’s another reason this restaurant is kind of difficult to visit. They’re only open to the public for 22 and a half hours a week! They serve meat-and-two meals from 11-2 Monday through Friday, but keep the burgers going until 3.30. If you do make it between the 11-2 window, apparently the roast beef is one of their more common offerings – they list the day’s entrees on Facebook – which worked out fine for Marie, since she loves roast beef so much. She had beets and green beans with hers and really liked it. Our son and I shared some fries – the only sour note, really, was the $2.50 price tag on frozen fries, but at least there were enough for us to share – and while he gobbled too much of Marie’s cornbread to finish his entire burger, he did at least claim to enjoy it. While we were the first to arrive, we were by no means the last. The Coca-Cola guy came in to get his very small delivery managed (the only sodas that they offer are Coke and Diet Coke) and get out of everybody’s way. Regulars and tourists alike flood in before 11.30, and Shannon disappointed a few at one table when she announced that everybody had to keep it clean because a kid was with them today. When we left, I smiled and told her that she could cuss again. “Forty minutes! That’s pretty good for me!” she exclaimed. Posted on August 5, 2015 August 23, 2017 by Grant G.Posted in burgers, chattanooga, roadfood, southern, tennesseeTagged burgers, chattanooga, roadfood.com, southern, tennessee. Have eaten at Zarzour’s several times. It’s hard to get a seat since this place is filled with locals at lunchtime. But it’s worth it once you get in. Most of the time, I order fried chicken — so moist yet crispy. But whatever you order, it’s genuine Southern! My family is moving from Marietta to Chattanooga next week, so I’ve been studying up on all your Scenic City entries! It’s good to know we’ll have so many great food choices, and I can’t wait to get to McKay’s. We’ll have to plan a trip to Zarzour’s for a day when we can take a longer lunch. Thanks for the comment! I hope your move goes well, and make sure to read Chattavore, because she covers the area much better than we can from here. Great report, Zarzour’s is one of our favorites. Innside is really good too if you want to shake it up a bit. And speaking of Chattavore, as I did in the comment above, I just read her story about Innside a couple of weeks ago. We might check that out sometime. Thanks for writing!